The Pointmaker PVI-X100 is a feature rich machine for both integrators and presenters. In addition to providing the power to focus audience attention with colorful markings and pointers, it transforms incoming NTSC or PAL video into outgoing high-resolution computer video. 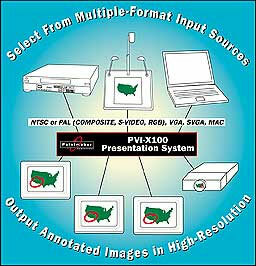 That means being able to connect diverse video units, such as an NTSC composite VCR or an S-Video document camera with the PVI-X100, and then easily select any of them for output to high-resolution computer displays or projectors. Life becomes much simpler: configuration and hook-up is a snap, and many video formats are reduced to one. Money is saved: fewer cables and components, less time interconnecting equipment. In classrooms, boardrooms, courtrooms, or anywhere points are made using video and/or computer technology, Pointmaker video markers are essential. They not only direct attention where it's needed most, but also enhance images through brightly colored markings. All PVI-X100 models come with a keyboard and are compatible with the presenter's most popular marking device -- a touch screen or touch panel (purchased separately, certain manufacturers). The model with digitizing tablet (PVI-X100D) includes software allowing the tablet to double as a PC mouse device. In addition to the digitizing tablet, the PVI-X100DL comes with a light pen that is used for drawing directly on a CRT computer monitor. Boeckeler Instruments, Inc., 4650 S. Butterfield Drive, Tucson, AZ 85714. Tel: 520-745-0001; Fax: 520-745-0004.